UC’s five medical centers are in for an eventful week. This Wednesday, May 15, starting at noon, UPTE’s 3,400 health care professionals are holding demonstrations at UCSF, UC Davis, UCLA, UC Irvine and UCSD to call on university bargainers to quit holding their pay raises hostage to pension cuts. The medical centers are highly profitable, and even UC bargainers admit there is money for increases. 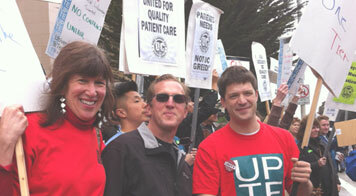 UPTE is encouraging all UC employees – whether union-represented or not – to support the day of action. After 97 percent of UC’s 13,000 patient care technical workers voted in favor of a strike, AFSCME 3299 set a strike date for May 21–22, after a year of failed negotiations with UC over staffing, wages and pension reforms for its 13,000 patient care technical workers. Another 7,000 hospital service workers represented by AFSCME are expected to strike in sympathy, joined by UPTE-represented health care professionals on May 21. Both AFSCME and UPTE are in bargaining with UC, and key issues include poor wages, pension cuts, under-staffing and patient safety. UC responded by seeking a court injunction to prevent the strike; the unions say they are on firm legal ground in calling it. After being evicted a year ago, more than 100 activists have re-occupied UC Berkeley’s Gill Tract in the neighboring city of Albany. The Occupy the Farm movement is demanding that UC convert the tract into an urban farm instead of developing an adjoining piece of land. With the US Supreme Court due to rule in the next few weeks on the fate of affirmative action in university admissions, the New York Times discussed the track record of the University of California’s efforts to devise alternatives to ensure student diversity.